KOVEMBER DAY 4: NO POWER + BOOKS. On today's episode of KOVEMBER thee unexpected happens. Something that is all too familiar in my little township outside of Philly.....THE POWER WENT OUT IN THE WHOLE TOWN! Instead of being annoyed that I had to change my plans for the day due to the power being M.I.A. everywhere on my side of town, I just picked up my camera anyway. Found the best spot of lighting in my condo and got to filming for the day! I really wanted to color my hair and install faux locs, watch Stranger Things and than film some videos. But instead I embraced the bit of light I had, threw on a hat to hide my crazy hair day, picked up my camera and shared with you my reading nook and the current books I'm diving into these days! First book on the list is Vaastu: The Art and Science of Living, which helps you to transform your living space and/or office into a space of good energy and blessings. Third is OKAY FINE, I'M GRATEFUL! A cute and cool little journal filled with pages to inspire and plenty of space to write down things you are grateful for everyday! And lastly on the list, HOT TODDY! Let me tell ya, the reviews on this one are so good! Definitely a page turner and I can't wait to get to reading it tonight! I guarantee you won't be disappointed and I will come back with a full review of this book sometime soon for sure! 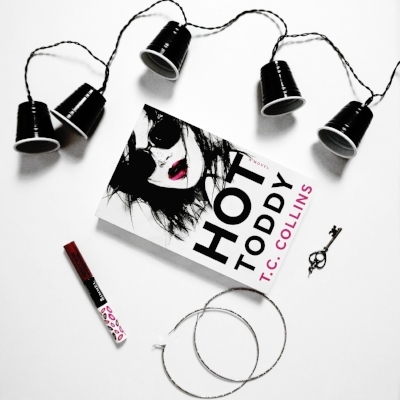 CLICK HERE TO GET YOUR COPY OF HOT TODDY NOW!!! Click the video below too check out my reading nook and more about the books listed! Also don't forget to subscribe to my Youtube channel so you won't miss a day of KOVEMBER!